This month, we feature a species from the sub-family Morphinae. 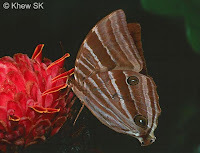 The sub-family Morphinae is represented by usually large and showy butterflies. 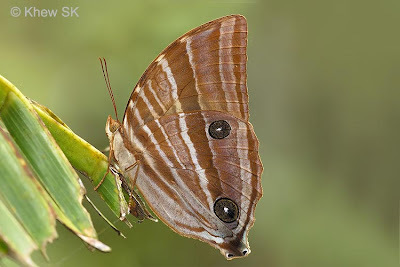 A feature of many of the species In the subfamily is the enormous size of the wings in relation to that of the body of the butterfly. Most prefer the habitat of the heavily shaded forest understory and tend to stay still for long periods of time unless disturbed. 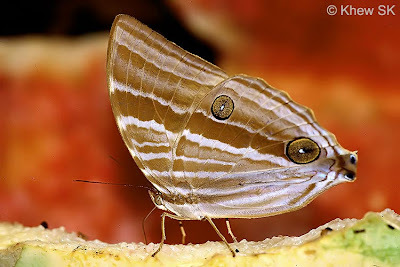 The majority of the species keep close to the forest floor, usually no more than a few centimeters from the ground, and, as they have cryptic and drab coloured undersides, are excellent at camouflaging themselves amongst the forest leaf litter. A number of the species feed greedily on rotting fruits on the forest floor. Most of the species’ caterpillars feed on monocotyledons, in particular Palmae, and the caterpillars are large and hairy, resembling those of moths. The Palm King belongs to the genus Amathusia, which comprise several species which look very similar, of which identification of the species may prove somewhat challenging. The Palm King, is the most wide-spread of the species. 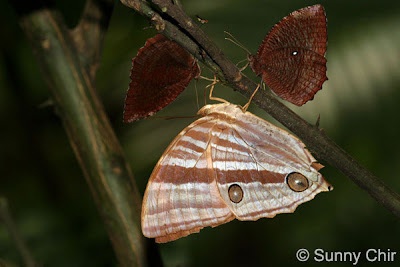 The male has rather obscure buff markings on the upperside, whilst the female is paler with yellower and more contrasted markings. 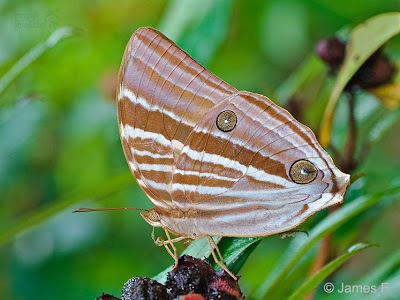 The underside features pale bands with a slight violet tinge. 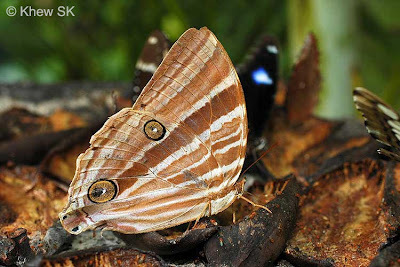 The tornal area of the hindwing is pronounced, but blunt, with black spots. 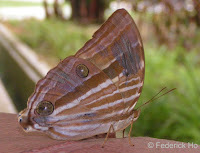 There are two white-centred large ocelli on the underside of the hindwings. The Palm King is usually found in the vicinity of coconut palm (Cocos nucifera) groves. 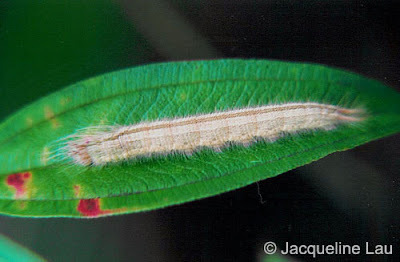 The caterpillar feeds on the leaves of the coconut palm. Given the nature of the species, it is likely that other palms, e.g. Oil Palm and other species of Palmae may also be host plants to the caterpillars of the Palm King. The butterfly is crepuscular in habit, and is often attracted to the lights of houses. In Singapore, it has also been seen on the walls of the Housing and Development Board (HDB) high rise apartments as high as the 7th storey on one particular occasion! It settles with its wings folded upright, and generally stays still unless disturbed. We have also observed individuals of the Palm King ending up as food for the common house lizard (gecko, or locally called the "chichak") back in Malaysia, as the butterflies are attracted to the lights of houses in the evenings. The Palm King tends to hide amongst trunks of trees during the day, and can be quite skittish when approached. Its brown colouration gives it a nature camoflage as it perches, usually upright, on trunks of trees or brown leaves and stems. It takes off in a capable fashion when disturbed, with a strong erratic flight, but it usually does not fly far, quickly settling down on another perch where it is able to camouflage itself again. The Palm King is considered moderately rare, and is not often seen with regularity, despite the fact that its host plants are found with relative abundance. It is observed in the forested areas, coastal parks as well as urban areas, and usually individuals are seen.